Female American dog tick with a dime for size reference. The American dog tick is the most common tick found in Iowa. Like all ticks, the American dog tick goes through an egg, larva, nymph, and adult stage during its development. While they may be found throughout the year, adults are most active during late April through May. The larva, nymph, and adult stages must each have a blood meal before they can develop to the next stage. The American dog tick has a fairly wide host range. Adults commonly infest both large and medium sized mammals such as dogs, cattle, deer, raccoons, and opossum. The immature stages may feed on these same hosts but prefer to infest smaller mammals such as meadow mice, squirrels, and chipmunks. All stages of the American dog tick will also feed on humans if given the opportunity. 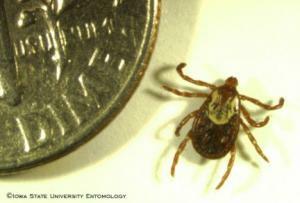 Although they are abundant, the American dog tick is not considered to be a serious human health threat in Iowa. Specifically, they do not transmit Lyme disease. Although dog ticks do not carry Lyme disease, they are the main carrier of Rocky Mountain Spotted Fever in the midwest states. Fortunately, this disease is relatively rare in Iowa. Control of American dog ticks in outdoor areas is extremely difficult. While several insecticides are labeled for outdoor tick control, they are usually not effective in eliminating large numbers of ticks in brushy, heavily wooded areas. There are, however, some management techniques that can discourage a buildup of ticks in these areas. Habitat modification is considered to be the most permanent approach to tick management. Since ticks must be in areas of high humidity in order to survive, they are most commonly found in grassy, brushy, wooded, and shaded areas. Therefore, reducing the humidity in these areas by keeping grass well-clipped, removing brush, and pruning trees to allow more sunlight to penetrate to the soil surface will discourage ticks from becoming established in these areas. The best approach when working or recreating in tick infested areas is to use personal protection in the form of repellents, wear protective clothing, and carefully inspect for and promptly and safely remove any attached ticks. How do I get a tick identified? You can submit ticks for identification to the ISU Plant & Insect Diagnostic Clinic. Please note that we do not test for tick-borne diseases, including Lyme's disease. Please click here for submittal information. Contact information for each states diagnostic laboratory for U.S. residents. If you live outside of Iowa, please do not submit a sample without contacting the Plant & Insect Diagnostic Clinic.